Praised for ‘playing of compelling conviction’ (The Daily Telegraph) and ‘full of sparkling detail, with tonal beauty and incisive rhythmic clarity, balancing wit and poetry’ (The Strad), Michael Foyle won The Netherlands Violin Competition 2016. His acclaimed performance of Szymanowski’s Violin Concerto No.1 with the Rotterdam Philharmonic Orchestra led to an immediate invitation to give his debut recital at The Concertgebouw, Amsterdam. In recent seasons, he also made his solo debuts in Wigmore Hall, Purcell Room, Buckingham Palace, Great Hall of Moscow Conservatory, Estonia Concert Hall and New York Chamber Music Festival, performing live on BBC Radio 3, NPO Radio 4 and Estonia Klassikaradio. During 2016-17, Michael performs the concerti of Beethoven, Bruch, Brahms, Elgar, Korngold, Lalo, Mendelssohn, Prokofiev and Tchaikovsky. In recital, he appears in Wigmore Hall, Bridgewater Hall, Usher Hall, Queen’s Hall, St. Martin-in-the-Fields, as well as in festivals in Austria, Estonia, Germany, Italy, Mexico, Russia and USA. In addition to his solo and chamber performances, Michael is engaged this season as Guest-Concertmaster of BBC Symphony Orchestra and Halle Orchestra. Born in Ayrshire in 1991, Michael gave his concerto debut in Edinburgh Festival Theatre aged eight. He went on to win the BBC Young Musician of the Year Tabor Award 2008 and the Royal Overseas League String Competition 2013, subsequently performing as a City Music Foundation, Park Lane Group, Kirckman Concert Society and Making Music Young Concert artist. 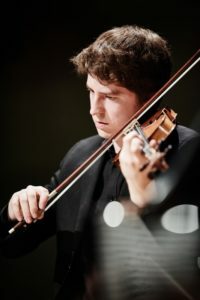 His acclaimed duo with pianist Maksim Stsura won the Beethoven Piano Society of Europe Competition and the Salieri-Zinetti International Chamber Music Competition in 2015 (‘superlative musicians and technicians … astonishing mutual understanding, feeling and responsiveness’ – Seen and Heard International). Upon graduating from the Royal Academy of Music in 2015, where he is now Violin Professor, Michael was awarded the Regency Award for Excellence and the Roth Prize for the highest violin mark of the year. Alongside his studies with Maureen Smith and Daniel Rowland, he received artistic guidance from Olivier Charlier, James Ehnes, Stephen Kovacevich and Maxim Vengerov. He completed his studies with a Certificate of Performance degree with Pavel Vernikov at the Vienna Konservatorium. Michael plays a Gennaro Gagliano violin (1750) on loan and is represented by Interartists Amsterdam. Either email Jennifer Moorhouse or phone 01706 817333. We gratefully acknowledge support from Todmorden Town Council.